By now, all of you should have noticed that we have a new website. If you did not receive an email providing instructions for logging in the first time and resetting your password, please let us know. We hope you like the new look and additional capabilities. So far, the feedback has been positive, which is a relief to me. We decided to push hard and finish the website quickly, so we did not have to maintain two sites any longer than necessary. I must thank my wife, best friend, first mate, helmsperson, “grammar counselor”, editor, and (now) web developer for all of her help and advice. We would not have made it this far without her efforts. Thanks. If you have not explored the new website, I encourage you to give it a try. The convenient listing of events, dates, and information should make it much easier to figure out when things are happening. On the front page, you will see the Upcoming Events, that provides an “in your face” list of the next three events on the schedule. To see all events, go to the Events page using the link at the top of the page. We also display subsets of events based on topic areas. For example, the events are subset down to items of interest to cruisers when you go to the Cruising Calendar. You will find targeted calendars for Cruising, Racing, Little Creek Sailing Association, Willoughby Racers, and Training. As needed, we will add more. For your mobile phones, you can download the Wild Apricot Members app. This provides limited functionality but focuses on listing the events and members. So, if you are away from a computer, you can just check the events calendar at any time on your phone. It also lists the events for which you have registered. To avoid providing full training for the website now, I will just mention some of the other big features. If you are logged in, you can view BBSA members sorted in multiple ways by going to the Members page and all the subpages associated with it: Members by last name, members by boat name, members by marina. Note that spouses or significant others are listed independently but associated with the primary member. We also created Forums in several places. Forums provide a way for the BBSA Board and web volunteers to create topics for members to offer feedback and responses. If you find a topic of interest, you can subscribe to that forum and receive automatic emails when someone updates the forum. A prime example is the Captain-Crew Matching Forum provided for Willoughby and LCSA. Racing skippers can post when they need crew and crew can post when they are available. If skippers and crew subscribe to that forum, they will get automatic notification of those requests. You can control how often you get those emails: Immediately, daily, weekly. I decided not to provide photo uploads on the main pages. Our vendor Wild Apricot does support that, but many members have their own photo libraries which can be linked to our website. That way we do not need to copy photos to multiple places and we save space at our site. This is a topic that is still up for discussion. We plan to write some additional BBSA-specific help documents and how some additional demonstration sessions to help you learn the capabilities. I am hoping that we can have a few computers set up at our April membership meeting, so people can come by and ask questions or get help. BBSA members Andy Spittler, Scott Almond, Bob Magoon, Guy Sorenson, and Eric Brinsfield attended. 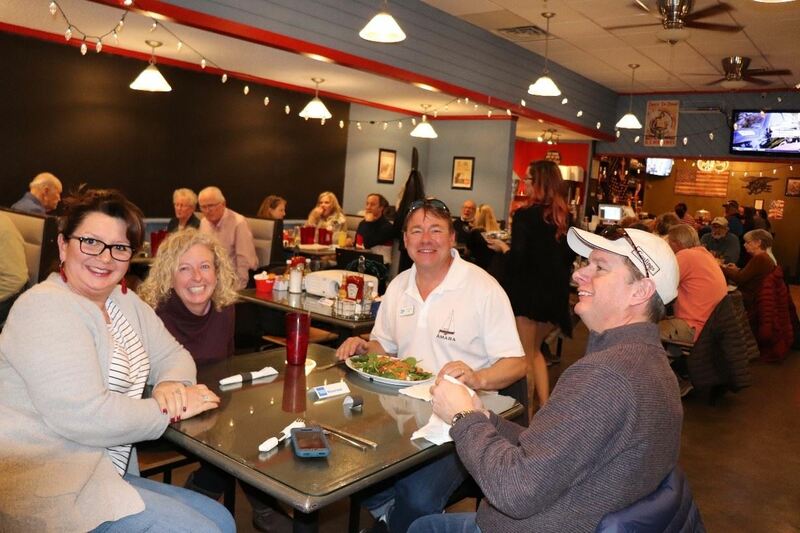 Our March membership meeting was hosted by Anchor Allie’s, one of our BBSA Championship sponsors. The food and atmosphere were great. At the meeting, we presented the website for the first time. As you can see in the photo below, BBSA filled Anchor Allie's. Both Little Creek Sailing Association (LCSA) and Willoughby Racers held their season kick off meetings. 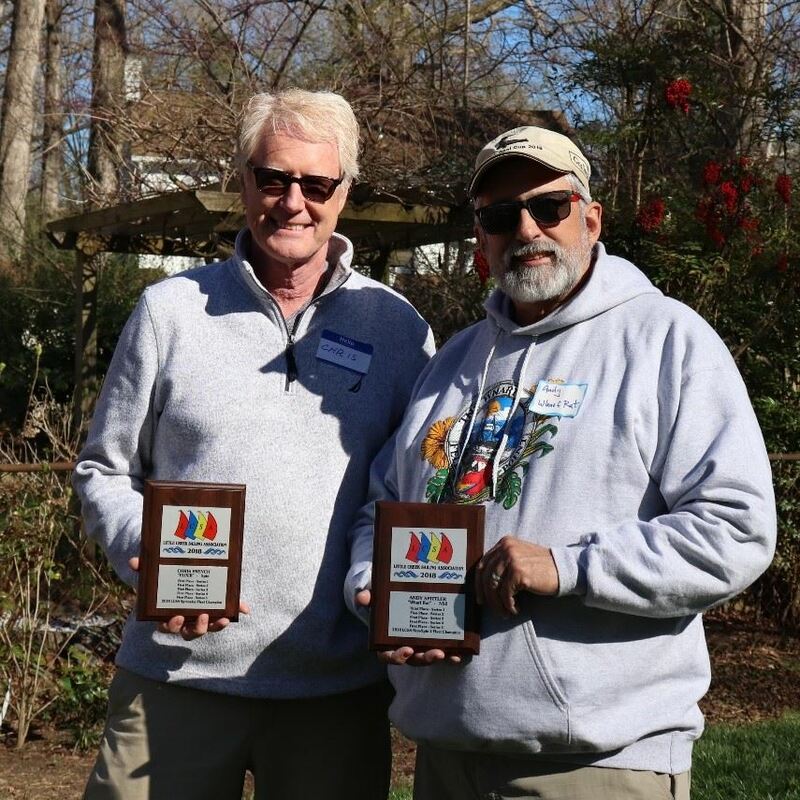 LCSA gave out awards for the 2018 season. Pictured above: LCSA 2018 Season winners, Chris French and Andy Spittler. Jay Thompson was not available. Mike Veraldi shared his experience and opinions on the best ways to prepare and start a race. The presentation and discussion were very interesting and included lots of audience participation. Thank you, Mike, for leading the topic. Finally, Cindy Lee Hall hosted the Annual Sock Burning at her beautiful home on the Bay off Ocean View. We had a wonderful time with lots of good food and great weather. We all reconnected after the winter break. Thanks Cindy and Eric. Be sure to see the stories below about the upcoming cruises, races, and social events. It is already April and we have our first official cruise to Yorktown on April 26-28. Unfortunately, the latest information indicates that the marina is full, but you can put your name on the list or take a land cruise up to Yorktown and join us. See the story below. #@#_WA_-_CURSOR_-_POINT_#@#Jerry Latell of Ullman Sails Virginia is offering a session on Sail Trim Around the Course. This is a must attend event for racers and cruisers. 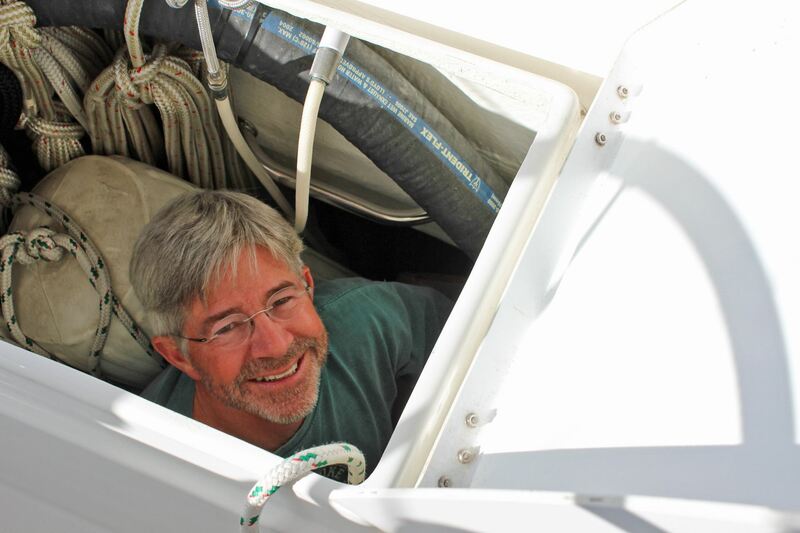 You can always improve your sail trim, so join us for this informative session. Our next membership meeting will be in place of the Rover Cruise. We will host a potluck at Sail Nauticus in the outside Pavilion. During the social hour, we will have several members posted around the Pavilion demonstrating knot tying techniques. Please swing by to get some great tips. We also hope to have website help demo stations. Please join us. As a new experiment, we are also planning at Marine Yard Sale on May 4. See the details below. We all have leftover boat equipment, anchors, clothes, electronics, plumbing, and other very valuable stuff that we don’t want to throw away. Join us at Bold Mariner Brewery and come sell or give it away your good junk. NOTE: Prior Commodore's Corners can be found in the Banter archive.